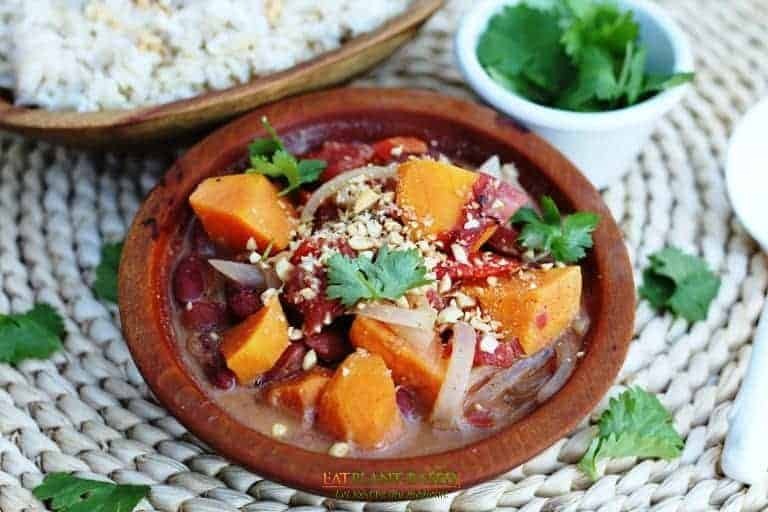 Vegan African Peanut Stew with sweet potatoes is one of my personal favorite recipes of all time! We make it regularly. The flavors are simply amazing, like a party in your mouth. If you only try one vegetable soup recipe, let this be the one. Believe me, I know the combination of ingredients sounds absolutely crazy! This stew is loaded with sweet potatoes, red bell peppers, red kidney beans, fire roasted tomatoes, ginger, cinnamon, and even peanut butter (or PB2). There’s an ingredient in town that mimics the nut butter’s flavor and cuts down its fat and calorie count by more than half: powdered peanut butter. The product, which might intrigue health-conscious consumers, is made by pressing peanuts to remove their fat and oil content, while maintaining their taste. 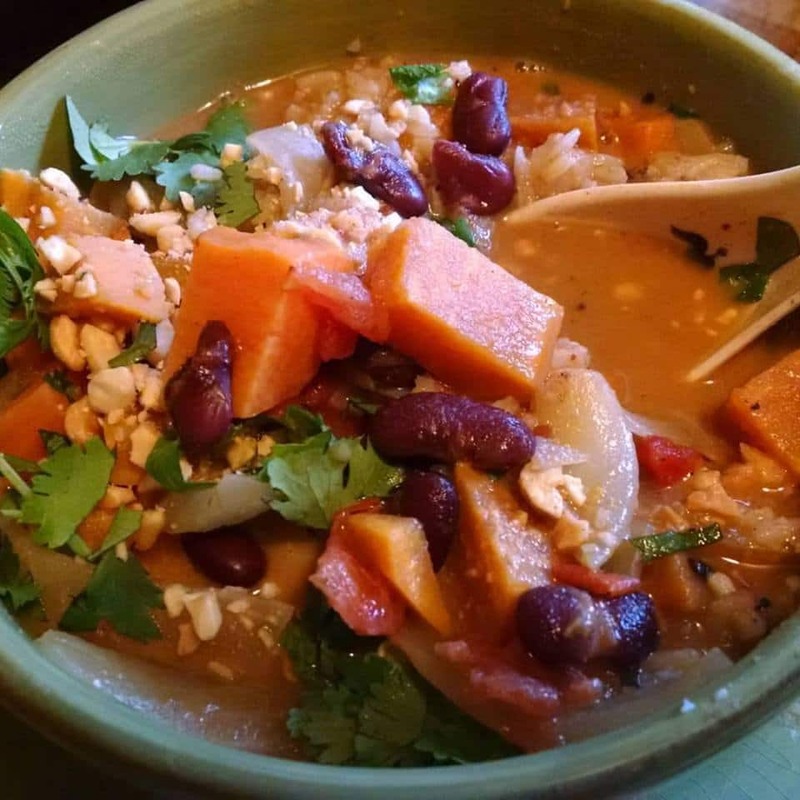 Served with rice, crushed peanuts, and fresh cilantro, this stew is simply amazing! 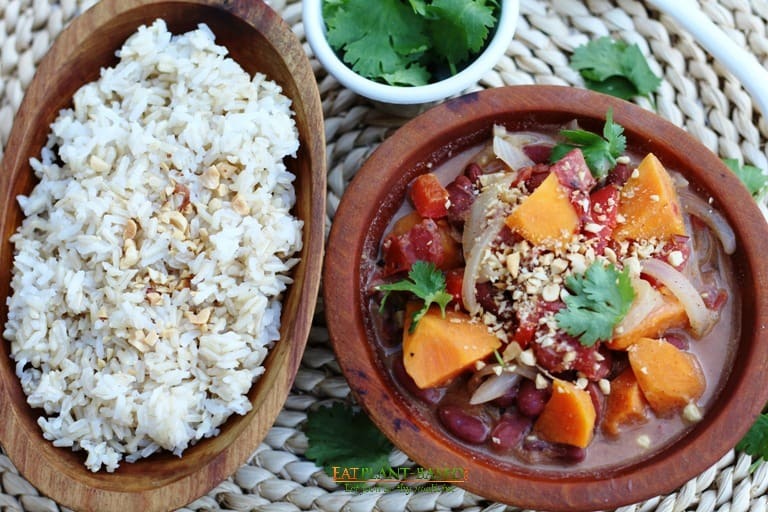 This amazingly delicious African Peanut Sweet Potato Stew is served over the rice of your choice. I love it over brown jasmine rice. 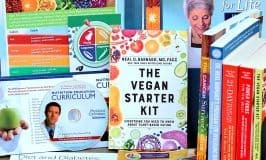 When we first began our plant-based journey, my husband wasn’t crazy about brown rice, because he loved the white variety. That prompted me to begin making a mixture of the two rices. 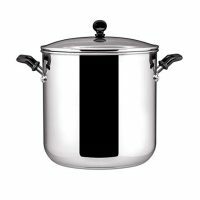 I would put both jasmine white rice and brown rice–in half and half measurement–into our rice steamer. These way, we could both be happy and get the nutritional benefits of brown rice. Brown rice is full of health-promoting fiber. 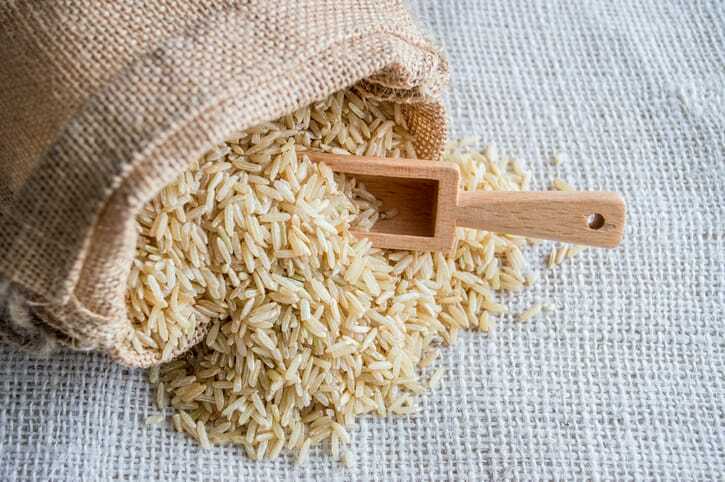 According to the U.S. Department of Agriculture, 1 cup of cooked brown rice, which comes from about 1/4 cup of dry rice, has 215 calories, 5 grams of protein, 1.75 grams of fat, 45 grams of carbohydrates and 3.5 grams of fiber. This is a layered dish. The first layer in your bowl is rice. Second layer is the peanuty stew, and the final layer is a sprinkling of crushed peanuts (optional) and fresh cilantro. Crushed peanuts and fresh cilantro are perfect toppings for this stew. The results are amazing! Seriously, if you only try one recipe, let this be the one. African Peanut Sweet Potato Stew is one of my personal favorite recipes of all time! We make it regularly. The flavors are simply amazing, like a party in your mouth. If you only try one recipe, let this be the one. I'm serious! Heat the water in a soup pot over medium heat. Add the onions and garlic and cook until softened, about 5 minutes. Add the bell peppers, cover, and cook until softened, about 5 minutes. Stir in the brown sugar (sucanat), ginger, cumin, cinnamon, and cayenne pepper, and cook stirring, for 30 seconds. Stir in the peanut butter, and distribute it evenly throughout. You may want to thin out the peanut butter first by mixing it with some warm water in a small bowl before adding it to the pot. It will be much easier to incorporate it into the stew. Add the sweet potatoes, kidney beans, and tomatoes, and stir to coat. Add the vegetable broth, bring to a boil, then reduce the heat to low and simmer until the sweet potatoes are soft, about 30 minutes. 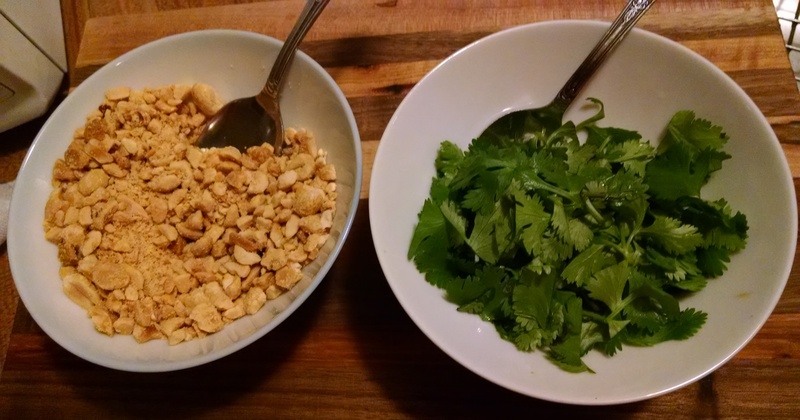 Serve in bowl over your choice of steamed rice, and top with chopped peanuts and cilantro. Instead of topping this with cilantro, use fresh fruits and veggies, chopped/sliced/diced. Make it like a salad bar, so everyone can top it their own way. That’s the way we learned the West African dish when we lived over there. Each bite can have a different flavor, one with pineapple, one with carrots, one bite like a pina colada with coconut and pineapple, grapes give a nice crunch, bananas give creamy texture. We’ve used: olives, berries, celery, peppers, onions, kiwi, nus, apples, pears, peaches, peas, corn, anything we had. Some were hits, some were ok. It makes it a party dish for the holidays. Around 1 lb of sweet potatoes should be about right, I would think. I’m allergic to Nightshade (tomatoes and peppers) could you offer any suggestions on substitutions please? Can this recipe be done without garlic? I made this recipe and both my husband and myself loved it, i was never keen on sweet potato but this is amazing. I am making it for my second time tonight, love it, thanks for this great recipe! That’s terrific! 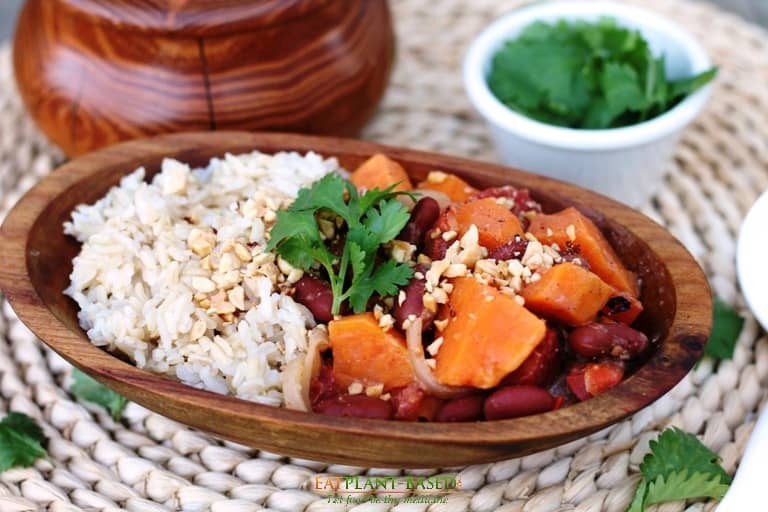 It is amazing how the flavors of sweet potatoes, kidney beans, tomatoes, peanut butter, and spices come together in this dish. So glad you enjoyed it! This recipe filled my 6 qt. 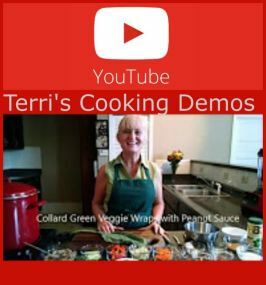 Instant Pot to the 10 cup line. I set it to cook for 10 minutes at high pressure and quick pressure release. The sweet potatoes were very soft, but did not disintegrate completely. Next time I’ll try pressure cooking for 8 minutes. I used PB Fit powder, which I did not realize had some sugar added when I purchased it: 2 g of sugar per 12 g of powder. I did not add any additional sugar and the stew was sweet enough without it. I stirred the PB powder in at the end before serving. My family enjoyed it! 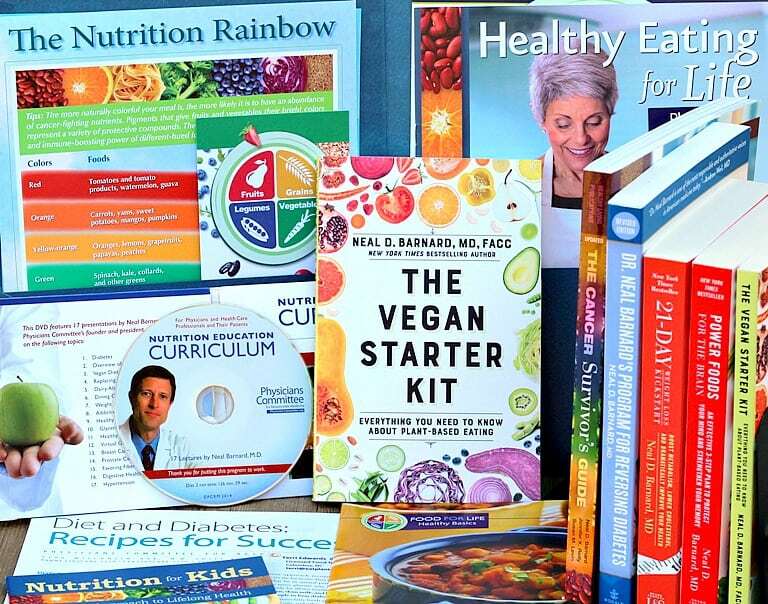 Melissa, thanks so much for sharing your experience making this in the Instant Pot. That is very helpful, as I know many others will be interested. So glad that your family liked this recipe! 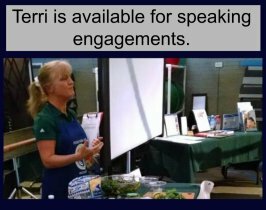 Terri, this is so good! I’m glad you gave the PB2 option (actually I used PBFit, love the stuff). Thanks! Definitely a keeper :-). I’m so glad you like it. This is seriously my favorite stew of all-time. I’ll have to check out the PB2Fit. Thanks for leaving the great feedback! Silly question… Do you just add the PB powder or do you make it into actual peanut butter before adding to the soup? I usually go ahead and make it into peanut butter, but my bet is that it would work either way. Heather, I just add the peanut powder dry and it works fine. This looks like a great recipe. I’m wondering how little of the peanut butter than I can use without ruining the taste. 3/4 cup is a bit much for my liking so I’m wondering if I could use 1/4 cup to 1/2 cup and still have it taste very good. Any idea if that would work? Maybe try it with 1/4 cup and add more as needed (if needed). 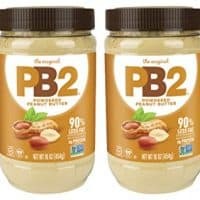 You could also use the PB2 powder instead of peanut butter if desired. The peanut taste is a pretty important part of this recipe in my opinion.